Cardamom plants normally start bearing capsules from the third year of planting. Picking is carried out at an interval of 30 days. Harvesting season in Kerala is October-February and the peak period of harvest is September-November. After harvest, cardamom capsules are processed. Cardamom capsules with green colour fetch a premium price. Hence emphasis has to be given on the preservation of green colour during curing and subsequent storage. The post-harvest operation consists of washing, pre-treatment with chemicals, curing, cleaning, grading and packing. Wash the capsules in water, immediately after harvest to remove the adhering soil and treat them with 2% washing soda for 10 minutes to retain green colour. Dry them either in sun or in drying houses by heat radiation, under controlled temperature (50 o C is optimum) to retain the delicate flavour and green colour. After drying, rub the capsules with coir mat / gunny cloth / steel mesh, sieve and grade. Cured cardamom has to be protected against light, air and temperature by packing in polythene lined gunny or cloth bags. Capsule should be processed within 24-36 hours after harvest to prevent deterioration. The harvested fresh cardamom contains 72-85% moisture. By curing, the moisture is reduced to 8-12 per cent at an optimum temperature so as to retain its green colour to the maximum extent. The retention of natural colour in the course of curing is a positive index of quality. The following are the important points to be remembered at the various stages. 1. Use only high yielding varieties having colour and uniformly bold capsules for planting. 2. Planting material should be procured from disease free areas. 3. Control of pests may be carried out with minimum use of recommended insecticides. As far as possible, use only bio-pesticides. Pesticides banned in the importing countries should never be used. 1. Harvest the crop at right maturity. 2. Use only clean bags for collection of capsules during harvest (never use empty bags earlier used for packing pesticides / fertilizers / chemicals etc). 3. Don't delay removing capsules from the spikes after harvest. 4. Remove capsules from the outer and middle whirls and collect them in one lot and those from the inner whirls in another lot. 1. Remove extraneous matter and wash thoroughly the harvested produce before drying. 2. Adopt flue pipe system of curing to retain the original colour, aroma and flavour. 3. Dry the capsules immediately after harvest. 4. 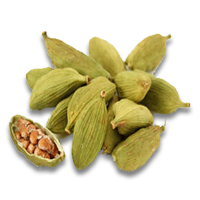 Dried cardamom should not contain more than 10% moisture for better shelf life. 5. Remove tails after drying. 6. Grade according to size and colour and store in moist proof containers. 7. Use clean, polythene lined gunny bags for storing. 8. Store in dry places and in wooden boxes. 10.The dried cardamom may be preferably sold soon after drying provided the growers get remunerative price, as long storage may lead to deterioration of quality.